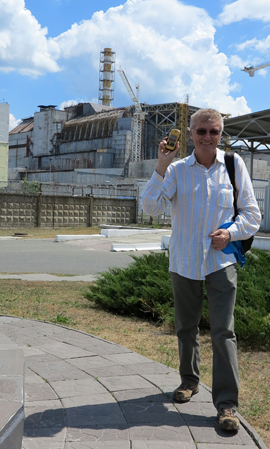 ◄ I’m standing outside Reactor 4 and holding up a Geiger counter to show that I’m quite safe. I know a lot more about radiation after my Chernobyl day. You can’t get away from it, a reading of between 0.09 to 0.30µSv/h (micro-sieverts per hour) is considered normal anywhere in the world. Get on a plane and fly at 30,000 feet and you’re looking at 2µSv/h. So a long flight, say across the Atlantic, is way more dangerous than a day spent visiting Chernobyl. Jump on to Wikipedia and you’ll soon find how many sieverts it takes to kill you. There are a million micro-sieverts in a sievert and if you suddenly got hit with a 3.5 sievert dose you’ve got a 50% chance of being dead in 60 days time. I read the book Voices from Chernobyl – The Oral History of a Nuclear Disaster in March, it really brings home the human cost of the debacle. 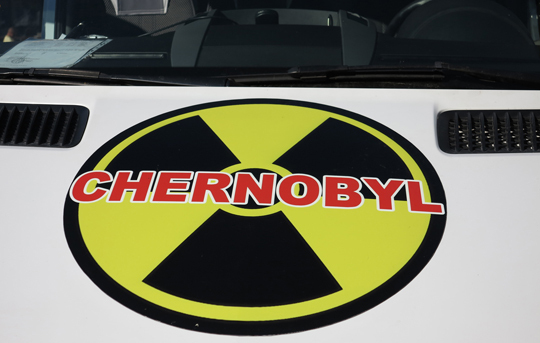 • The Chernobyl reactor isn’t at Chernobyl. The town of Chernobyl is about 20km from the reactor. Pripyat, the ghost town just three km from the reactor, is the real Chernobyl centre. • Reactor 4 was one of six Chernobyl reactors. Numbers 5 and 6 were under construction at the time of the explosion, they were never finished. After the disaster reactors 1, 2 and 3 continued to operate, but all of them were shut down by 2000. • A new European-funded ‘sarcophagus’ is being built behind reactor 4 and when completed (it’s way behind schedule) will be slid across reactors 4 and 3. The old rough-and-ready sarcophagus over reactor 4 will then be dismantled with remote controlled equipment within the new sarcophagus and all the nuclear fuel in the reactor will be removed. This is going to take quite a few years. • I pointed out in my March blog that almost all the early deaths were firefighters who raced to the reactor after the explosion, but it was the town firefighters from Pripyat who died, not the firefighters actually at the reactor, they had enough sense (or knowledge) to hang back. • And what about those radioactive catfish? Well they can grow impressively large (you get to feed them), but catfish do grow to a surprising size, it’s nothing to do with radioactivity. 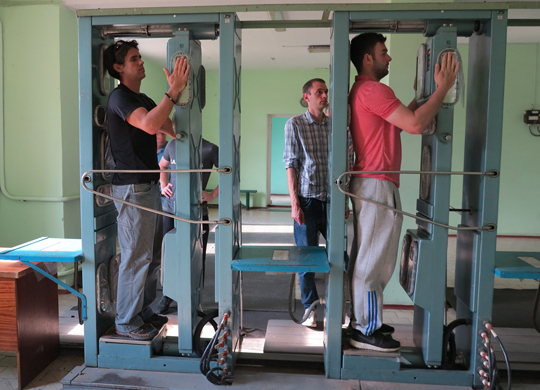 ▲ I went to Chernobyl with SoloEast, one of a number of Kiev Chernobyl tour operators and it was a very typical tour. You’re picked up in the centre of Kiev at around 8 am, drive to Chernobyl town, check out the town and memorial, continue to the weirdly wonderful Duga-3 Soviet missile warning array (more on that in a future blog), before visiting the Kopachi kindergarten (very close to the reactor) and arriving at the reactor itself. Then it’s on to Pripyat and a stop back in Chernobyl for lunch on the way back. It was after 7 pm by the time we arrived back in Kiev. Pripyat was a model town, opened in 1970 at the same time as the reactor, and abandoned a few days after the 26 April 1986 disaster. It’s remarkably like the Bougainville Papua New Guinea mining town of Panguna which I visited in 2012, except that’s gone back to the jungle rather than the forest. 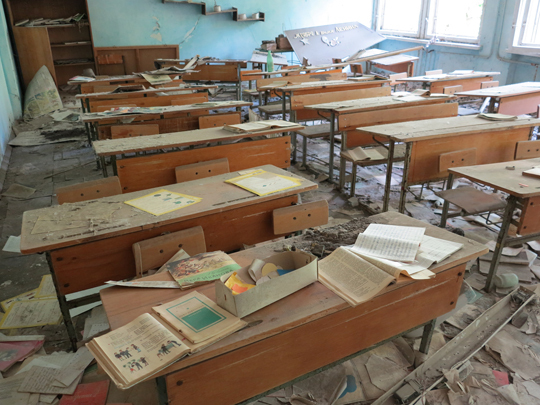 ▲ Pripyat was remarkably well equipped and modern, your town tour takes you into the school and it’s those abandoned class rooms which are particularly poignant. There’s also the cultural centre and theatre, the town swimming pool, the football field (now turning into a forest) with its abandoned spectator terraces, a restaurant, the ferry terminal from where high speed ferries ran to and from Kiev. 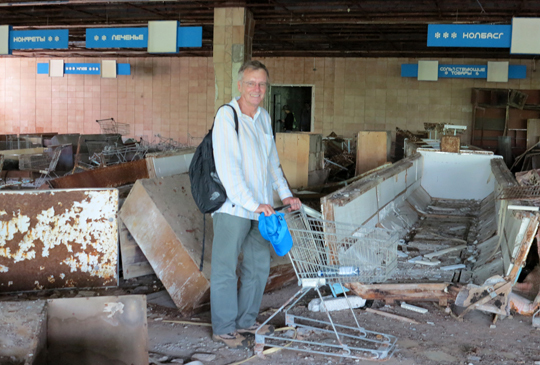 One thing Pripyat didn’t have – a church. Communism was the religion. I’d really have liked longer in Pripyat and it is possible to do two days tours with an overnight at the hotel in Chernobyl – not at the Pripyat one from where you could actually see the reactor from some rooms. Unfortunately we didn’t go inside the hotel or into any of the apartments, there were an amazing number of apartments, when it was abandoned the population was about 50,000. They were a young 50,000, the average age was just 27. 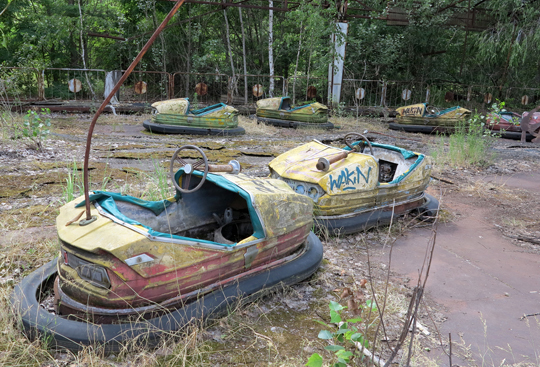 ▲ Pripyat’s amusement park with its ferris wheel and dodgem cars is probably the single most iconic image of the town. It was brand new at the time of the disaster and due to open on 1 May 1986. They opened it on 27 April to keep people’s minds off what they suspected had happened just a few km away. That was the only time it was ever used. ▲ Coming in to town your documents are checked 30km out and again 10km out, although neither distance is precise. Departing you’re checked for radiation at the same checkpoints, perhaps you’ve foolishly wandered off track and your shoes are now radioactively dusty? This is the 30km checkpoint, we were all OK. Although the cover up and the subsequent rough-and-ready clean up – men hurling bags of sand out of open helicopter doors into the open reactor or clearing radioactive graphite off the roof with shovels – seems to sum up the Soviet Union in its dying days, cover ups and primitive clean ups weren’t a Russian exclusive. A New York Times story just a few weeks ago revisited 1966 when the USAF accidentally dropped four nuclear bombs on Spain. None of them exploded but American military personnel are still suffering the after effects of the clean up. So is the Spanish town of Palomares.